Walter Decoster Dennis, jr., born in Washington, D.C., was a graduate of Virginia State University and held a law degree from New York University. He attended General Theological Seminary and was ordained in 1956, taking up a position under Bishop Donegan as the first African-American cleric to serve at the Cathedral Church of St John the Divine. In 1960 he was called as Vicar of St Cyprian’s in Hampton, Virginia, where he served for five years. During this period he also taught constitutional law and US history at Hampton University. 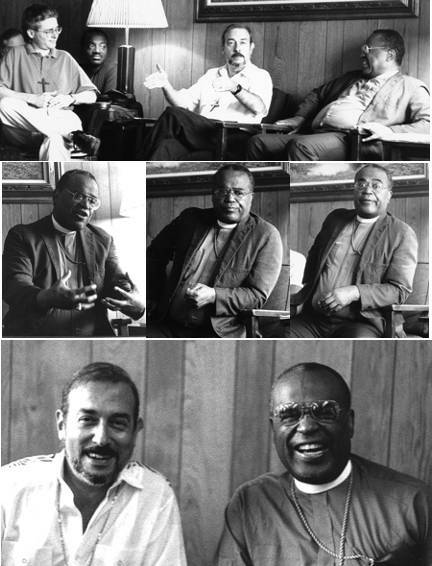 He returned to New York and the Cathedral in 1965, serving as Canon Residentiary, continuing his work in advocacy and civil rights, and forming a close friendship with fellow Episcopalian Thurgood Marshall. Dennis was elected Bishop Suffragan in 1979. Although favored by many to take up the office of Diocesan at the 1989 election, a sudden medical emergency at the end of the first ballot led him to withdraw his name from consideration. He continued to serve as Suffragan until his retirement in 1998, at which point he returned to Hampton, where he died in 2003. Dennis took up the office of Visitor in 1989, when Moore’s successor as Diocesan, Richard F. Grein, chose to remain as Visitor to only two of the many communities functioning in the Diocese of New York. Even before becoming Visitor, Dennis had been of significant support to the Brotherhood, in particular lending his expertise in canon law to the revision and adoption of an inclusive canon on religious communities in 1982. Dennis also offered this expertise to the Brotherhood in some of the reworking and amendment to the community’s Constitution. He was also the first Visitor to spend significant time with the Brotherhood — often the whole week of Convocation. In addition to his other ministries, Dennis was a founding member of the Union of Black Episcopalians and of the Guild of St. Ives, a group of ordained attorneys who offered their services to the poor and underprivileged. Paul Moore, jr., was born into one of America’s first families. After graduation from Yale, he joined the Marines and served with distinction in World War II. Like many a young man of his era, his experience of war led to a call to ministry, and after studies at General Theological Seminary he became rector of an inner city parish in Jersey City in 1949, serving for almost a decade. While there he gained experience and notoriety as a social activist and advocate for civil rights and economic justice. After serving as Dean of Christ Church Cathedral, Indianapolis, he was elected Bishop Suffragan of Washington in 1964, where he again earned public notice for his civil rights and anti-war activities. Elected Bishop Coadjutor of New York in 1970 he became Diocesan in 1972, serving until retirement in 1989. In this role he continued to be no stranger to controversy, both in civil society and in the church. He advocated for the ordination of women, and ordained the first open lesbian priest, only later to walk back this action when challenged by other bishops. It was assumed that Moore had automatically become Visitor to the Brotherhood on the retirement of Bishop Donegan, but this came as a surprise to him, and he only actively took up the office in the late 70s, attending the community’s tenth anniversary Chapter at St. Bartholomew’s Church, White Plains, in 1979. At the 1982 General Convention, Moore joined Bishops Suffragan Stuart Wetmore and Walter Dennis in supporting the Brotherhood's efforts to amend the canon on religious communities. Moore had great affection for the community, whom he dubbed “The Flexible Friars” (and in a less guarded moment, “The Keebler Brothers” — no doubt a comment on the brown, hooded Witness Shirt adopted in the mid-80s). Horace William Baden Donegan was born in Derbyshire, England, and moved with his parents to Baltimore, Maryland, at the age of ten. He was an undergraduate at Saint Stephen’s College, Annandale-on-Hudson, New York. He later studied theology at Oxford University and obtained his divinity degree in 1927 from the Episcopal Theological School in Cambridge, Massachusetts. Donegan was ordained to the priesthood on May 28, 1928, and served as curate of All Saints’ Church in Worcester, Massachusetts for two years. He was rector of Christ Church in Baltimore until 1933, when he became rector of St. James’ Episcopal Church in Manhattan. He served this socially prominent Madison Avenue parish until his election as Bishop Suffragan of New York in 1947, succeeding Charles Kendall Gilbert when elected diocesan in 1950. Donegan served in that position until his retirement in 1972. His episcopate was marked by his decision to suspend work on the construction of the Cathedral Church of Saint John the Divine in order to devote resources to housing in nearby Harlem; his involvement with civil rights and advocacy for the poor led to some controversy. In 1969, when the Brotherhood was founded, the 1913 canon governing religious communities required recognition by the bishop of the diocese of foundation. Bishop Donegan understood that the Brotherhood was not a monastic community, and foresaw the potential of religious life as expressed in the context of the wider world. Donegan recognized the Brotherhood on May 11, 1970, in a statement he wrote to the community’s Founder. Though he retired as Bishop within three years of the Founding of the Brotherhood, Donegan remained in New York and retained his association with Saint James Church. Gregorian Friars who lived in the area were happy to see Bishop Donegan at various events, and he always greeted and expressed interest in this new creation whenever the opportunity presented itself. Donegan was “a man of the century” and died in 1991 at the age of 91.